About our various cruises and things that happen during them. 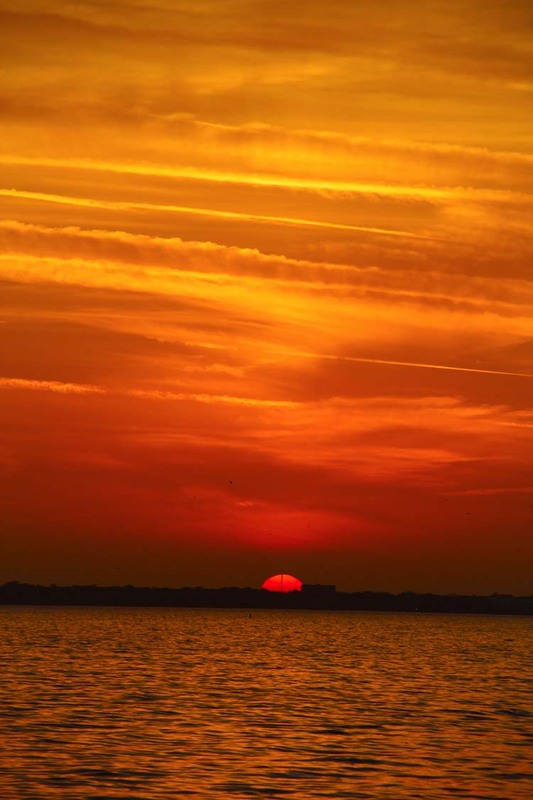 Spectacular sunset sailing, steady predictable winds, and comfortable temperatures – all the wonderful things we love about Tampa Bay and Gulf Coast sailing in the fall. Apparently Cupid has an affinity for the season as well. 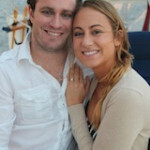 The past few months have been a great time for marriage proposals aboard Lionheart. Congratulations to these lucky couples as they begin a glorious new life together. One of the most wonderful perks about operating Olde World Sailing Line is the opportunity to share time with such interesting and fun-loving couples. 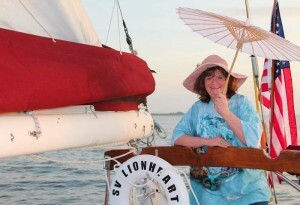 Lionheart is a “happy boat” and this is certainly a “happy” business. 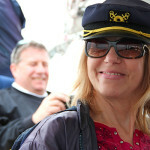 The smiles of our guests are always infectious and engaging. This is especially true when we are honored to be chosen as the venue for one of life’s most exciting and solemn moments – a marriage proposal! 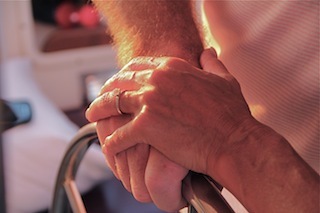 We take this honor very seriously and pull out all the stops to help make this occasion one of the lifelong hallmarks in the lives of these lucky couples. 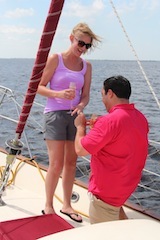 Thank you all for choosing Olde World Sailing to host this first formal hallmark on your brand new life together. Congratulations and best wishes. 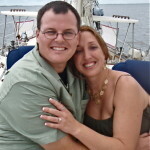 Update: a new video sneak peek at many happy couples celebrating their love on SV Lionheart! In mid-June, Olde World Sailing Line will present one of its most unusual cruises, unique in all of west-central Florida. 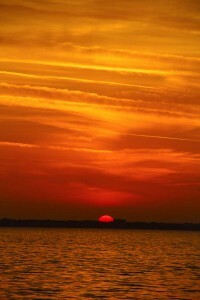 On Saturday, June 22, the sun will set at 8:24 pm, the second longest day of the year. At about the same time the sun is setting in the west, the full moon will be rising in the eastern sky – a fairly rare event. As the sky turns from bright reds and oranges through deep shades of purple, the huge full moon will dominate the eastern skies. While close to the horizon, the full moon appears twice its normal size, painting ever-changing Monet-like reflections on the waters. It is a rare and spectacular sight to behold. 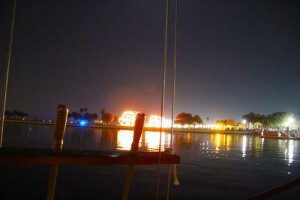 Lionheart will make other Full Moon Excursions on other days surrounding June 22nd. Friday’s sail is fully booked, but Sunday and Monday will also have a moon nearly as full as that of the 22nd, with moonrise only a little later. Don’t miss this opportunity to experience this unique astronomical and maritime event. We’ll make memories you will treasure for a lifetime. 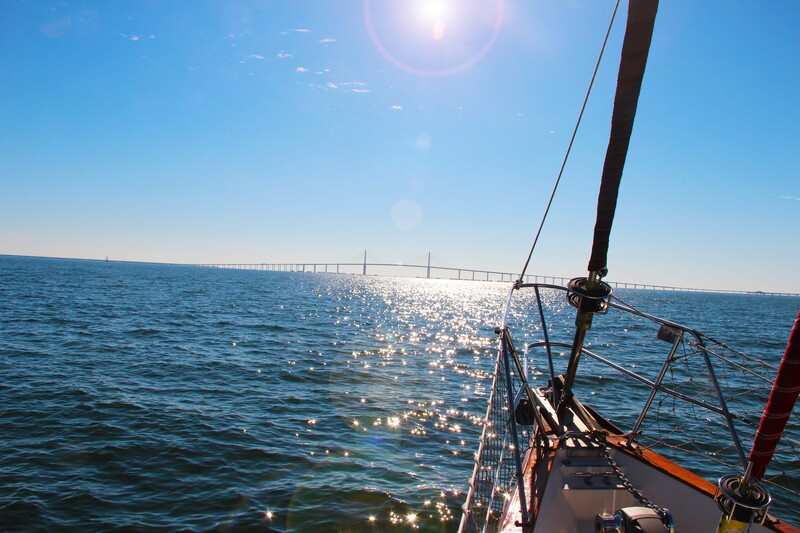 Like all Olde World Sailing cruises, you will be treated to Tampa’s most luxurious sailing line, with extravagant hors d’oeuvres, live music, flowers, and First Cabin service from the moment you board. Make your reservation today…Click Here! 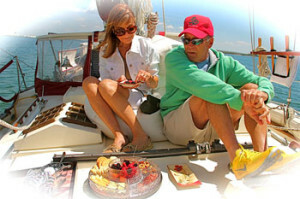 Olde World Sailing Line has developed a reputation for providing the most luxurious day cruises from Tampa. 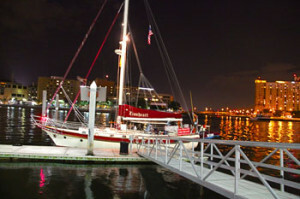 Are you ready for a Tampa romantic getaway? 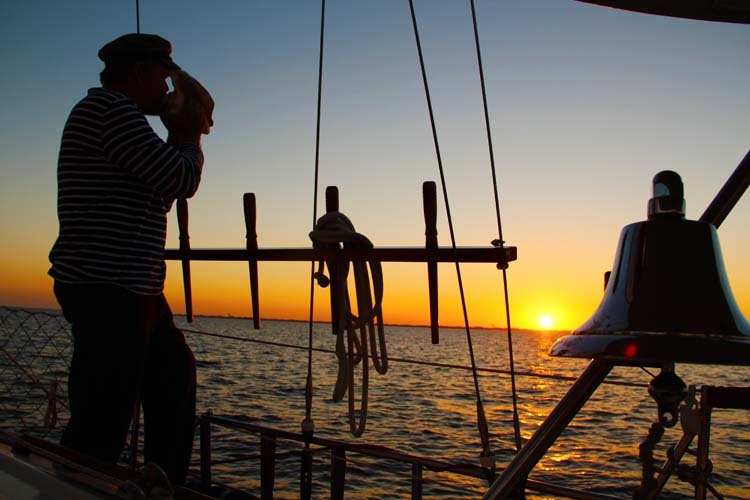 Whether a beautiful Half Day Sail, Full Day Sail, or magnificent Sunset Cruise, we strive to make every sail a very special occasion for our guests. Each cruise features elegant hors d’oeuvres, fresh flowers, imported chocolates, live music, all aboard a 44’ world class sailing yacht. 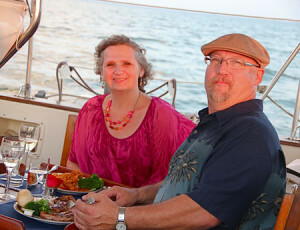 It is on Olde World’s Sunset Dinner Cruises, however, that Lionheart pulls out all the stops. 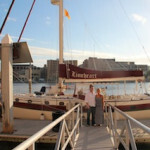 Dinner Cruises cast off from the Tampa River Walk docks a couple hours prior to sunset. After riding the winds toward the setting sun over Tampa Bay, your teak table is set with fine china, cloth napkins, and silverware. In the galley, your chef is preparing a full 3-course dinner that you selected prior to your cruise, catered from a downtown Tampa restaurant. 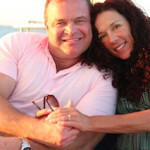 As the sun sets, Lionheart becomes your own private “waterfront restaurant”. 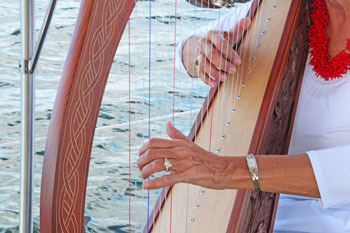 Your meal is accompanied by the music of a Celtic harp, played by Kathryn, former Florida Orchestra principal harpist. Desserts, chocolates, and bubbly as you wish. Magnificent. 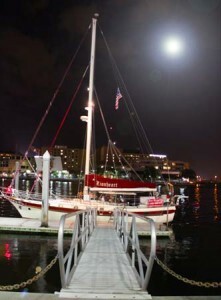 Then conclude your Tampa romantic getaway with a sail back toward civilization and to the spectacular colors of city’s waterfront after dark. 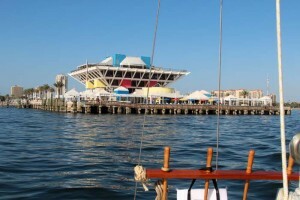 You haven’t seen the Tampa Bay area until you’ve seen it from the sea. And you’ll have a completely different and magical impression, when you experience it after nightfall. 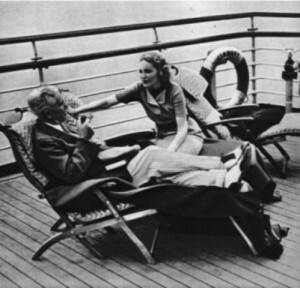 The final sailings of 2012 were spectacular. The light itself on these short December days has a different quality than that of the warmer months. The air is more crisp and clear, seeming to move the visual horizon miles beyond the dog days of summer. 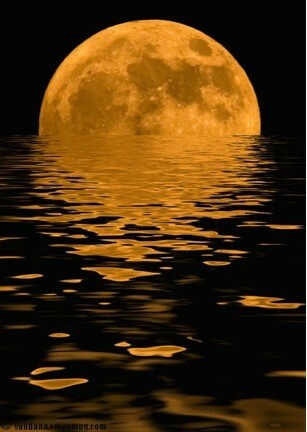 The reflective shimmer on the waters is spell binding. Even the sounds of the gulls, diving pelicans, and broaching dolphins seem more intense. 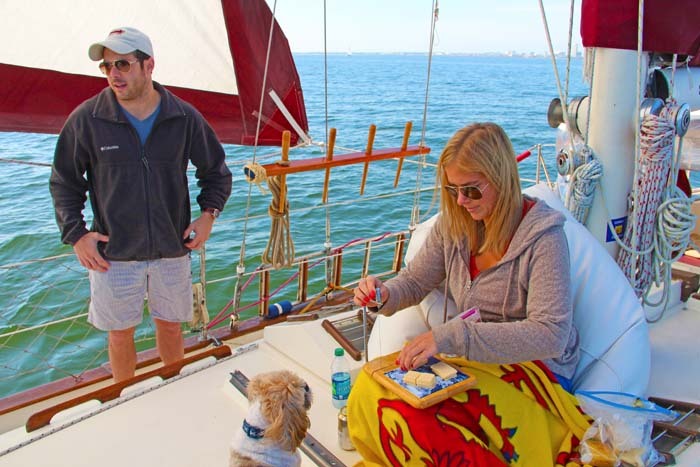 Winter sailing in Florida has a magic all its own. One of our favorite places to ring in the New Year is the Vinoy Basin in St. Petersburg. 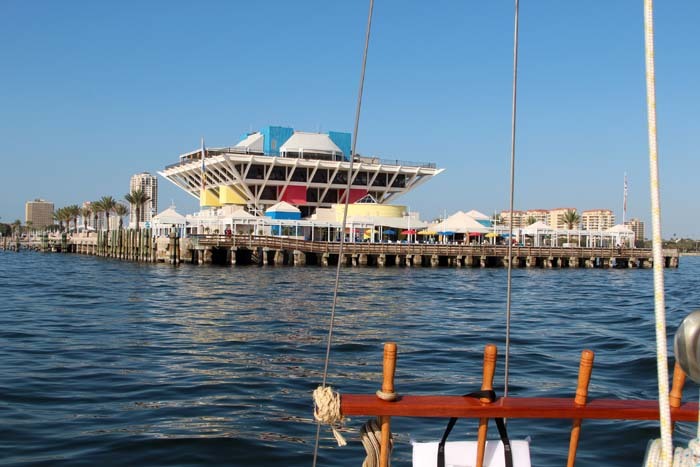 This protected small anchorage is surrounded by one of the most vibrant waterfront communities in Florida. High-end shops line Beach Drive, beautiful parks with sculptures, sprawling banyan trees, and a rare kapok tree, world famous museums, and eclectic restaurants. And of course standing guard at the mouth of the harbor is the iconic St. Petersburg Pier – even more beautiful as seen from the water. A decades-old Florida landmark. Few communities put on a better firework show to welcome the New Year than St. Pete. 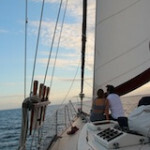 And no better place to be awed by them than from an anchored boat. 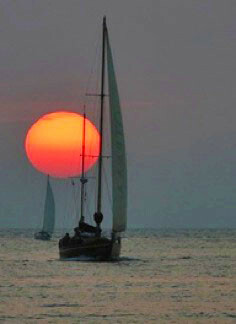 Please enjoy and “like” our pix of our year-end sailing festivities – better yet, come and join us as we sail into 2013. And don’t forget to check out our higher res photos on Pinterest. Can’t be too careful about that December Florida sun. Do something worth remembering. Come sail with the iconic Lionheart, flagship of Olde World Sailing Line, as we pay tribute to the elegant, bygone era of First Class sea travel. 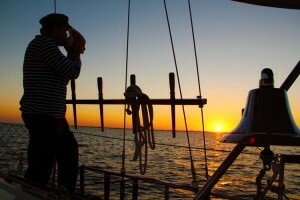 A sailing journey is a vivid tapestry for the senses… inhale the fragrance of the salt-tinged breeze, hear the sound a seashell makes, feel the gentle cadence of the sea, and experience the romantic siren sounds of sea shanties from one of the word’s most ancient instruments – performed live onboard by a renown orchestral concert master. 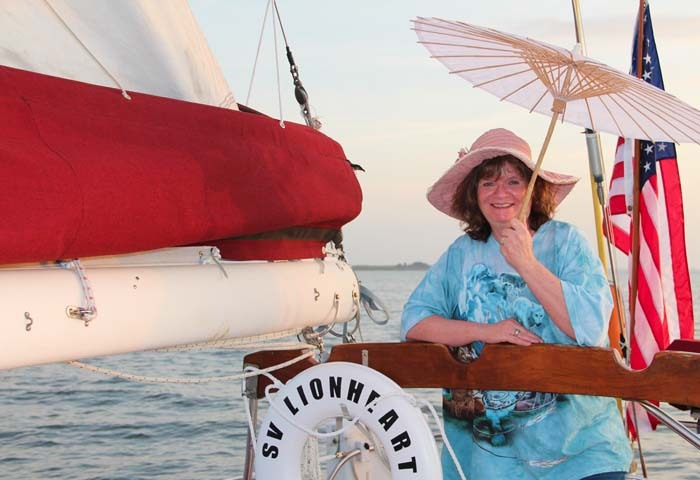 Whether a glorious afternoon at sea or a romantic voyage in celebration of the setting sun, your Lionheart seaborne adventure will creat memories to last a lifetime.